The Taylor 614ce Builders Edition is one incredible guitar! 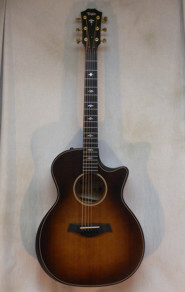 It features a solid Torrefied Sitka Spruce top, figured Big Leaf Maple back and sides, and Taylor's new V-Class bracing. This model also features premium woodworking details that refine the playing comfort on both the body and the neck. A beveled armrest along with beveled body edge treatment and a double carved cutaway make this guitar feel like it belongs in your hands. Other details such as the Silent Satin Finish, gold Gotoh 510 tuning machines, Wild Honey Burst finish, Mother of Pearl inlays, inset Maple/black body purfling with matching rosette, and Expression System 2 pickup put this guitar in a class all on it's own. Includes a hard shell case and a custom setup from your friends at Steilberg String Instruments.